It was only a matter of time before slack demand in the rest of the world backed up into China, the world’s biggest manufacturer. 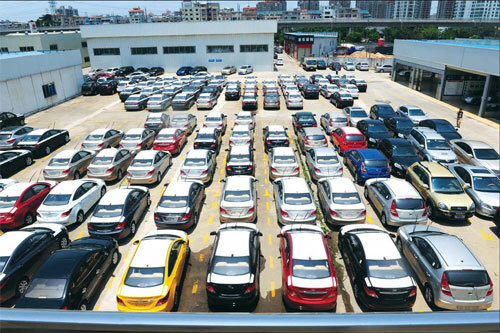 According to an article in the New York Times finished goods have been piling up in Chinese warehouses, car dealers’ lots and in the spaces between other things in factories. China is in the early phase of an inventory recession, a situation that happens when production gets ahead — or in this case, way ahead — of demand. It’s a textbook case of too many goods chasing too few dollars, Euros, Pounds — you get the idea. We see much less of this kind of downturn in the west for some good reasons. First, we have really good supply chain technologies and practices so we know early on that things will back up and manufacturers slow down production to avoid having the kind of glut that now affects the Chinese. Second, and more important, we take the signals from the market seriously and have transparency in government. We report the actual truth instead of what we think we want to see. The Chinese? Not so much, especially in the latter case. Classically, the remedy in this situation is to curtail production, which leads to fire sale pricing. Economists call this working off the excess inventory, real people call it unemployment. The Chinese government can’t afford unemployment especially now because they are in a once in a decade leadership swap-out and because employment is the national unemployment plan. They don’t have much of a social safety net and the government doesn’t want to throw a number of people out of work that might rival the entire population of a European country or large American state. So the finished goods pile up. Short term, WalMart has more to sell at lower prices. But soon the reverse will have to happen. Goods will get scarce and prices might actually rise. Maybe. The recession mania around the world is unfolding like a textbook demonstration of all possible types. Here in the west for instance, we are having — or had depending on where you live and your political persuasion — a credit based recession. That’s where there are too few dollars chasing goods and services but not leading to inflation because demand has dug a hole in the floor. It’s not like there is no actual demand, but for some reason, banks have had to rebuild their balance sheets after the wild party they threw themselves five or so years ago and they aren’t lending. So in this case, lack of credit is stifling demand. Whatever happened to supply side economics? You know, the idea that if you build it they will come? The Chinese have done their jobs in the supply side scheme but the rest of us seem to be letting them down. Actually, the part of supply side no one likes to talk about goes like this: all markets clear — at a price. This means that products match up with buyers until all the product is all gone, but there’s no guarantee what the price will be for the marginal goods, i.e. those that were made in excess of reasonable demand. That’s where the firesale comes in. Oh sure, things are beginning to get better in selected places but in most cases the economy is still pushing on a string. What to do? Too many goods in the Far East, too little credit in the rest of the buying world and suddenly, too little employment all over the place. The prevailing wisdom tells us to tighten our belts and show confidence but we’ve been doing that for many years already and the “Confidence Fairy” as Paul Krugman would say, has failed to materialize to sprinkle pixie dust on the economy. We could always try some proven macroeconomic ideas. Nah.